Today, MyShingle is excited to introduce our latest offering for the legal community: 143 FREE Tools & Resources to Start, Run and Grow Your Law Firm, available at our site HERE. 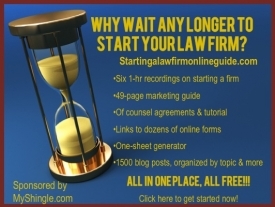 Although the web is bursting with lists of free tools to start a business, somewhat shockingly, no comparable, comprehensive guide exists for law firms and so, I created one. One caveat about the guide. As most MyShingle readers are aware, many of today’s practice management systems like Clio, MyCase, RocketMatter, Practice Panther all include many of features such as timekeeping, billing & invoicing, document assembly and document storage that are available through some of the free products. As nice as it is to find something for free, it’s probably easier for lawyers just starting out to invest in a practice management system (all of which are eminently affordable) than to hack a system together. That said, these tools can come in handy if, for example, lawyers want to experiment with non-law firm side gigs that they want to keep separate from their practices – such as selling legal information products or starting some other kind of ancillary business. Moreover, the guide includes tools galore to help with website design, graphics, marketing materials, and legal research – so even if you’re already a loyal practice management customer, there’s still plenty of resources to help with your practice. If you have any feedback on the tools listed, or if we’ve left out some of your favorites, please let us know either in the comments or by email or through our contact page so that we can add them to the Guide.